Kate Jones and her lover, Cole are on a luxury cruise in the Caribbean when a passenger dies of an apparent heart attack and the ship is boarded by modern-day pirates. Along with two other passengers, Kate is kidnapped by a long-lost enemy who wants to settle an old score. Kate's vacation turns into non-stop action when Anaya's gunmen board the cruise ship and she finds herself on a jet ski surrounded by sharks, kidnapped, held captive, staked down over patch of fast growing bamboo, and drugged in a Voodoo ceremony. Add a 16th century Spanish shipwreck, hidden treasure, and an Obeah priestess and you've got trouble in paradise. Will Kate escape certain death or end up as shark bait in the middle of the Caribbean? 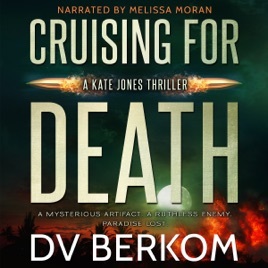 It's adventure in paradise and promises all the fast-paced action listeners have come to expect from the Kate Jones Thriller Series.